GULF Industry Fair, held in the first week of February, proved a strong platform for SMEs and larger firms to project their businesses and to network. The three-day event had the participation of 127 companies from the Gulf and internationally who featured products ranging from metals to paints to oil sector equipment. 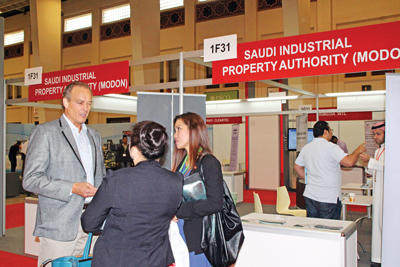 Modon, the Saudi organisaion that operates industrial hubs was present as was the Bahrain International Investment Park. 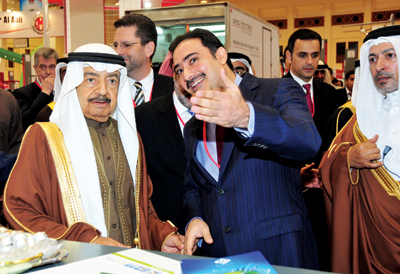 Tamkeen, the semi-government Bahraini organisation was instrumental in bringing a number of exhibitors through its financial support. GIF lived up to its reputation of being a premier trade event of its kind in the Northern Gulf. We present here some of the companies that participated. GIIF 2014 was the sixth consecutive year that Bapco, as part of the National Oil and Gas Authority group of companies, has provided top level support to the B2B event. The company, a sponsor of the Energy and Environmental Protection segment of the fair, showcased its latest strategic upstream and downstream projects and investments along with related commercial opportunities for exhibitors and visitors. “Exhibitions such as Gulf Industry Fair are vital in promoting the products and services offered by the SMEs sector in particular,” Bapco chief executive Adel Almoayyed said. 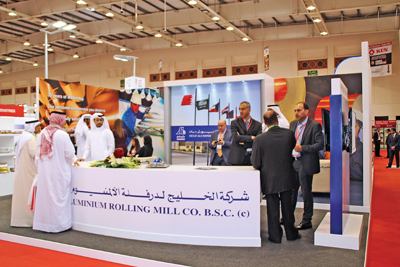 Aluminium Bahrain (Alba) was present as a strategic partner representing the aluminium sector at the event. Alba, one of the world’s largest smelters, showcased its high-quality products and its plans for growth as well as its efforts towards safety, preservation of the environment, community advancement and Bahrainisation. The company is among the top contributors to Bahrain’s economy and also among the largest employers of Bahrainis. Asry recently completed a period of investment in its facilities and capabilities, and in the near-term the company is focusing on bedding-down and consolidating these new resources. The ship repair services division continues to be the largest contributor with just over half of all income. Offshore Services is a close second. Consultancy and other miscellaneous operations make up the remainder. The breakdown is roughly unchanged in comparison to 2012. Majaal, a wholly-owned subsidiary of First Bahrain Real Estate Development Company, was the sponsor of the logistics and industrial facilities segment at GIF. The company has enjoyed steady growth since its February 2010 inception, achieving full occupancy of a 12,000 sq m first phase in late 2011, in addition to completing and fully occupying the 12,000 sq m second phase at the Bahrain Investment Wharf site in June last year. GARMCO is a world-class supplier of flat rolled aluminium was the message that the Bahrain-based company aimed to put across at Gulf Industry Fair. Since its inception in 1981, the company has been on an ongoing expansion drive which has positioned it as the largest downstream aluminium facility in the Arabian Gulf region. Today, more than 80 per cent of its output is supplied outside the region to major markets worldwide. “This success is reflected in our continuous increase in capacity, enrichment of our product range and continued investment in downstream facilities and associated offices around the world,” said a spokesman. HAJI Ali Haji is planning to expand its switchgear range and chief among its development plans are exploring the Qatar market, where it already has an office. Gulf Industry Fair helps to strengthen its customer base in Bahrain and establish new contacts with companies in the Gulf region, said group general manager Dr Adel Dairi. The sole agents of Hyundai switchgear products, the company provides customised distribution boards and panels and manufactures its own cable trays and trunking. “The customised cable trays are available in different sizes suiting customer demand,” said Hashir Ahammad, assistant manager – sales and marketing – switchgear factory division. The company also specialises in electrical telecommunications products that enjoy competitive pricing, according to Ahammad. Haji Ali Haji is playing a key role in Ministry of Housing projects with some of its finished projects including KFC and Hardees outlets across Bahrain. The company’s upcoming projects include Baisan Hotel on Amwaj Islands. ALAA for Industry (AFI), which launched an industrial vacuum loader or the “supersucker factory” at its Dammam facility recently, hoped to gain new avenues into the regional market at the fair. 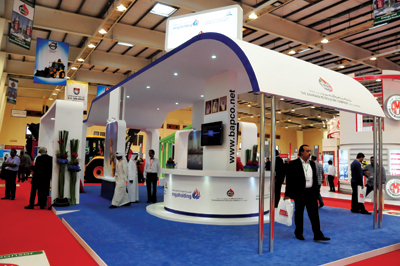 The Dammam-based engineering firm exhibited hydraulic systems and components including pumps and motors, valves, cylinders and torque wrenchers; pneumatics such as motors, cylinders, valves, compressors, dryers and filters, and a range of seals including hydraulic and pneumatic seals, oil seals and customised seals. One of the recent developments was the launch of a new authorised centre for Enerpac products in Dammam by AFI, which is the authorised distributor in Saudi Arabia for the Enerpac range of products, which includes cylinders, pumps, valves, hydraulic presses, pullers and various other industrial tools including bolting tools. Some of the popular products belonged to the pneumatics range such as motors, cylinders, valves, compressors, dryers and filters, fittings and tubings, said Matio Pinca Morales, marketing supervisor of AFI. AFI was recently conferred API certification for its hose assemblies. ALPHA Fire Services, part of the Alpha Safety and Security Holding, showcased its latest range of innovative fire protection systems and chemicals. Alpha Fire Services, the group’s main operational company, has been active since 1989 and is a triple certified ISO company, approved by the American Bureau of Shipping (ABS), Det Norske Veritas (DNV), Bureau Veritas (BV) and Lloyds. It is a full-service fire safety and security organisation involved in the design, supply, fabrication, installation, commissioning and maintenance of fire prevention, detection, protection and suppression systems, closed circuit television (CCTV), barrier and access control systems, risk management consultancy or fire risk assessments and continuity planning for all classes of buildings from private residences to industrial, commercial and other public buildings. Alpha Fire also offers annual contractual maintenance and repairs, refills, tests and revalidates all types of fire equipment in its fully-equipped workshops that are managed by a complement of fully trained and experienced technical and engineering staff. RECORD investment projects are coming up at Bahrain International Investment Park (BIIP). The park highlighted the benefits for industries planning to set up base within the 2.5-million-sq-m business park in Hidd. Modon, the Riyadh-based Saudi Industrial Property Authority and one of the world’s biggest holders and developers of industrial enclaves, has stepped up its momentum of developing new industrial cities with a view to bolstering economic growth for both the public and private sectors, diversifying the economy and raising employment levels. As many as 709 new industrial projects were set up in Modon industrial cities in 2013 against 450 in the previous year. In total, Modon oversees enclaves hosting 4,400 factories with an investment of more than SR300 billion ($79.9 billion) and employees exceeding 350,000. Modon supervises a network of 32 industrial cities (recently revised from 29) occupying a total area of 92.78 million sq m. A management team is assigned for every city to ensure smooth running of operations. International Agencies Company Limited (Intercol) showcased the wide range of business activities executed by its diverse divisions, chief among them being Marine and Technical Services (MATS). Currently, MATS offers the only facility in Bahrain specialising in the repair of high-speed propellers of up to 42 inches in size and is also equipped with the latest turbo-balancing equipment that is regularly maintained and upgraded as new technology becomes available in line with international standards. TEBODIN drew attention to its broad scope of independent consultancy and engineering services – from project initiative through to completion. Part of Bilfinger, the international consulting and engineering firm has more than 4,900 employees across 25 countries. “Our extensive office network allows us to offer clients the best of both integrated engineering and consultancy expertise combined with local knowledge,” said a spokesman for the company. Tebodin services include consultancy, design and engineering, project management and procurement and construction management. It also undertakes turnkey engineering, procurement and construction management projects (EPMCm projects) over a wide range of sectors. SAUDI-based Pan Gulf is showcasing two of its prime CNC machines at the fair – the portable CNC cutting machine and the Dragon CNC gantry for bigger jobs. Among Pan Gulf’s product line-up at the fair is a new range of small inverter welding machines.